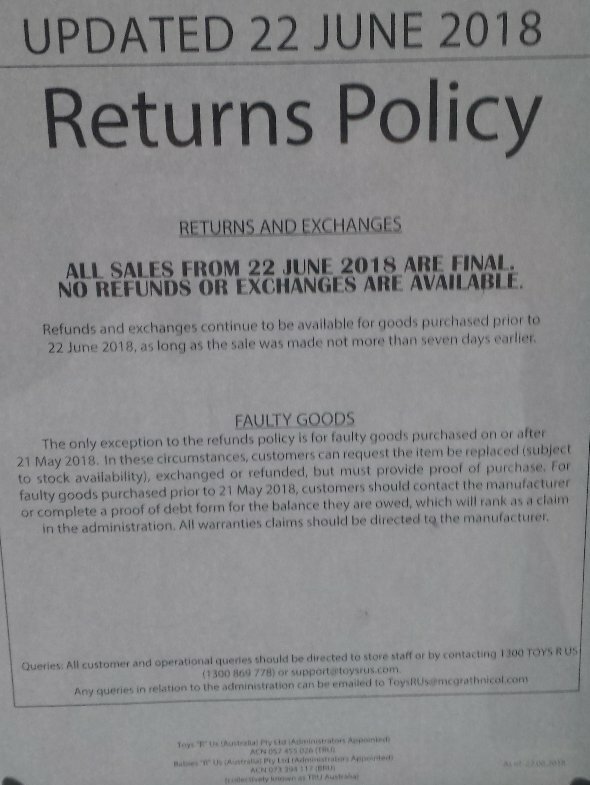 A few weeks ago, we had to report that Toys R Us Australia went into administration. 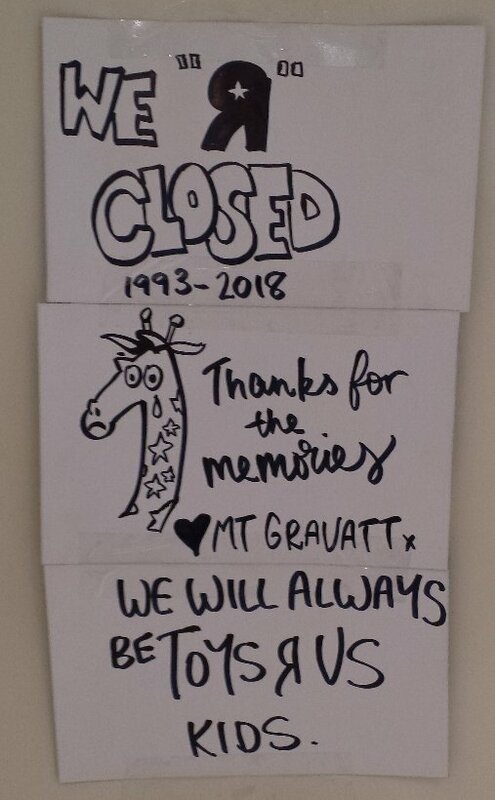 It was an unexpected and sad event for Australian fans, since it seemed Toys “R” Us Australian stores will continue on the business like other stores in Asia, despite the US main brand closing . There was one item that was left into unknown destiny. While back in February, Masterpiece MP-34S Shadow Panther was announced as a Toys R Us Australia Online Exclusive. You could pre-order it for AU $110 (US $90 approximately) plus shipping. Then, you had to wait until October 2018, when pre-orders would finally be delivered. Ozformers board member millhouse reported that he finally received an official e-mail about this matter. “We regret to inform you that unfortunately we are not able to fulfil your Toys R Us Online Order for the following product, due to insufficient stock levels. We can however, offer for you to choose other items to the same value, on our website www.toysrus.com.au and we will process this at no further charge to you. We can also provide your details to our creditors, who will contact you with a proof of debt form request. The other alternative is to lodge a dispute with your bank for the amount charged on your credit card for this transaction. You will more than likely get your money back for the order we are unable to fulfil. We understand your frustrations with this matter and sincerely do apologise for any inconvenience caused. Australian fans are not going to receive the item they paid for, and there’s no formal refund for it, sadly. It seems that raising a dispute with your bank may be the best solution. We hope all Australian fans will get their money back soon. You can now click on the bar to join to the ongoing discussion on the 2005 Boards. CLOSING DOWN! Hurry in quick as we are hours away from closing down forever! Save 70-80% and more storewide! The doors are beginning to close so visit your store today! The store nearest me, the Garden City store is now closed. This was the final 30 minutes, with a few people walking through one last time, like the viewing of an open coffin at a funeral…. I have to admit that I spent a lot of time and money at this store, and despite the good and the bad, this Toys"R"Us store will be greatly missed by me, as will all of the others around the country that I have visited or purchased from (I have probably been to at least half of the stores in Australia), as they would always be a store I would check out if I came across one in my travels (not to mention, the priority store chain I would look for and visit where ever I was in America, which I will also greatly miss). 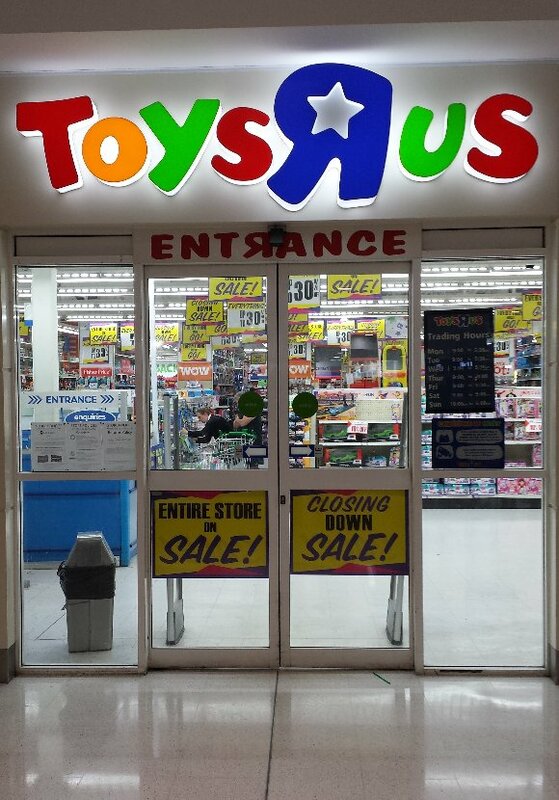 All remaining ToysRUs stores in Australia will CLOSE this weekend. 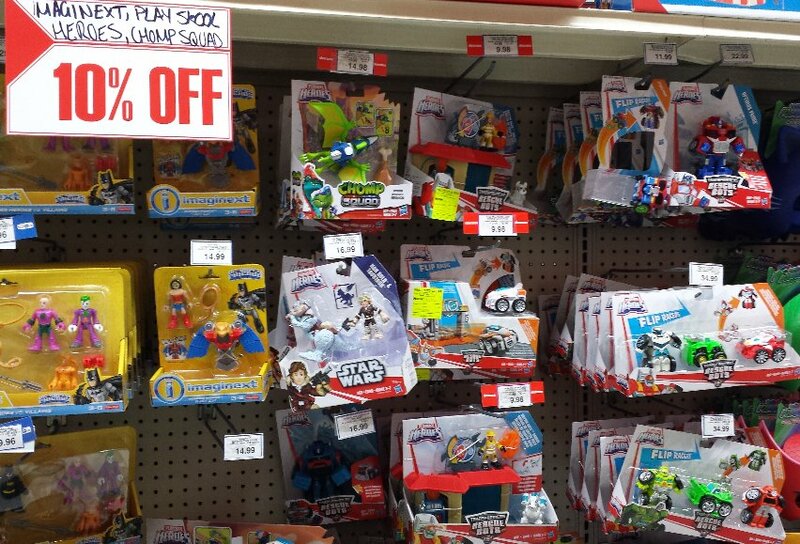 If there is any toy stock left, it is now at over half off, while all non-toy items are at least 50% off. 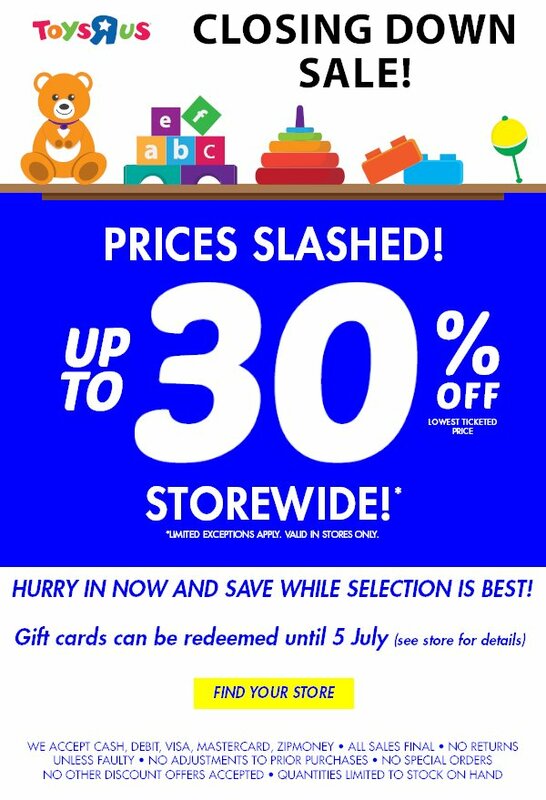 To find out which stores are still open, and which days the last ones are closing (if they have something left to sell), check out the ToysRUs Australia website… while it still exists. 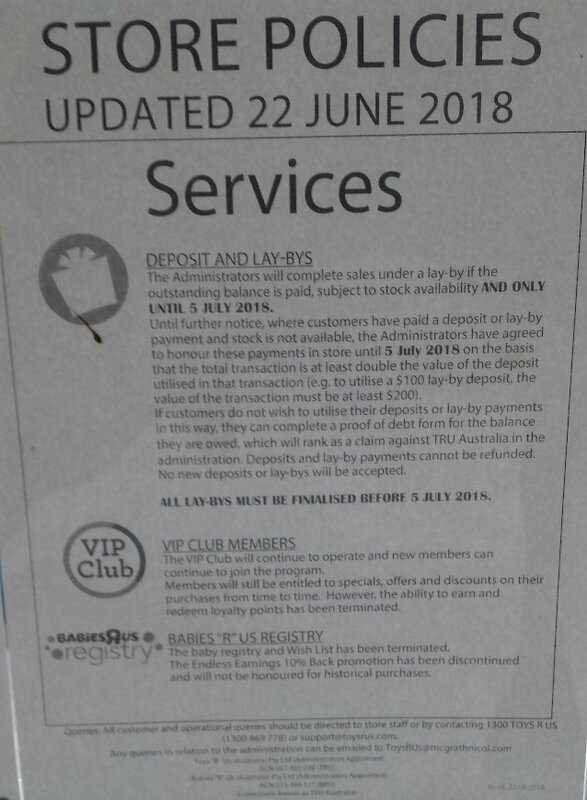 This is indeed the end of an era for toy collectors in Australia, after 25 years of ToysRUs stores in most states and capital cities of Australia. When they first came here in the early 1990s, they squeezed out some of the existing competition, and after a period of stagnant growth from the mid 2000s, we saw expansion of the business in the last 2-3 years, opening several new stores (almost 20% more stores) and plans to open several express stores over the next year or two… but it was just too late, as the expense of expansion was not yet offset by the extra revenue of all of those new stores before the US company needed to sell off the Australian business. 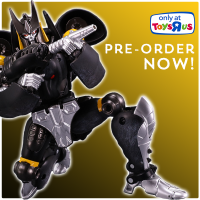 It will certainly change the toy collecting landscape here for a while, as ToysRUs were the main source of store exclusive Transformers from Hasbro, and really the only business willing to take on Japanese Transformers (even if they were often significantly over-priced). With Amazon now ramping up their business in Australia (following the recent blocking of their American site for purchases that are posted to Australia), maybe we might see them as a future outlet for exclusives, as has happened already in America after their ToysRUs stores closed in June. I subsequently went back to my local TRU, and they hadn't even increased the discount, yet most of their transformers stock was gone. Can't say that there was a lot I was interested in to begin with, but it looks like I may have missed the boat on a couple of things. Keep your eyes peeled. A lot of the "good" stuff disappeared pretty quickly at the U.S. TRUs well before they hit the deep discount levels. So, if there's a TRU-exclusive you've been eyeing, you might want to grab it sooner rather than later. Yeah, they have that at my local TRU. Call me a cheapskate, but I think I'll wait until it's something more substantial (at least 30%). Toys"R"Us Austria still exists and, along with Toys"R"Us Germany and Toys"R"Us Switzerland, has recently been bought by Ireland-based toy giant Smyths, who are now the biggest toy chain in Ireland and the UK. All German, Austrian and Swiss TRU stores are planned to be rebranded as "Smyths" by next year. Despite the Brand disappearing from USA, Puerto Rico, England, Australia, Germany, Austria and Switzerland, it should still exist in other countries… but they probably won't operate as a united global entity for things like exclusives and promotions, as they would just end up being separate businesses that just have rights to use the same Brand name in their own country. Oh of course, how could I be so silly?! 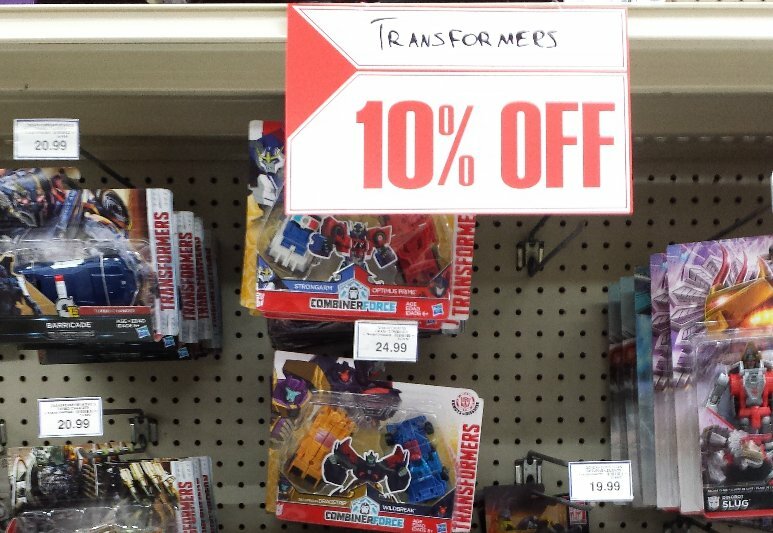 The first week of the closing down sale has Transformers at 10% off… and expect the percentage to increase every week or two like in America. 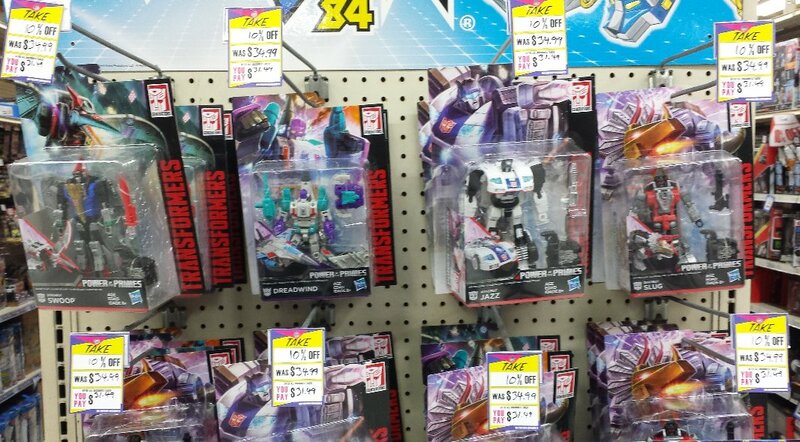 Discount signs everywhere, with Transformers being given 10% off to begin with. The same with Playskool (Rescue Bots). 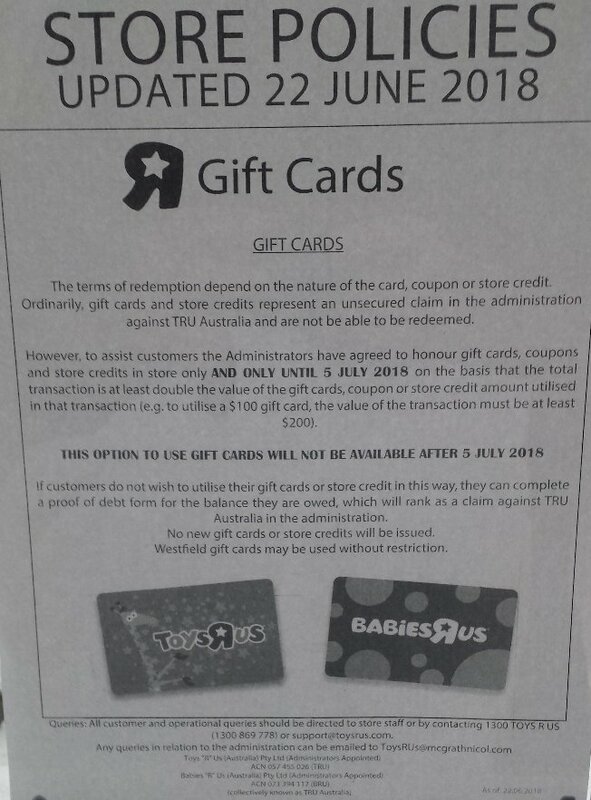 Of note in the new Store Policies, is that gift cards and coupons will not be accepted after July 5th (two weeks time), while you will not be able to exchange or return anything bought from now on (unless it is a faulty item), and if you want a refund from a layby or pre-order that ToysRUs can no longer fulfill, you will need to see if your bank can do a chargeback (if you paid by credit card), or go to a ToysRUs store to get a form to make a claim from the Administrators (which is unlikely to get any money back, as the banks and investors are likely to get all of the money raised from selling off the business and assets). Also, there is no more price-matching and VIP points now either. …Yep. Cheap, greedy, money-grubbing corporate slimy scum. Australia's $2 billion toy industry is going through a seismic shift as the nation's largest specialty toy chain shuts up shop, putting hundreds of millions of dollars in annual sales up for grabs. Toys 'R' Us, which makes up about 10 per cent of the market, ignited a fire-sale on Friday as it prepares to shut all 44 of its Australian stores in the coming weeks, with industry players expecting major department stores to be reassing their toy ranges to try to nab that market share. Steven Kulmar, from the consultancy Retail Oasis, said Toys 'R' Us' large-store "destination" model appeared to have failed as consumers started to prefer shopping at department stores, online, or at smaller stores that offered a better experience. "Clearly the entry of online has a massive impact on it, and the long-term success of discount department stores playing in babies and toys has had an impact on it," he said. The $2 billion of toys Australians buy from stores every year is roughly split 50/50 between department stores, and independent and specialty retailers according to research firm IBISWorld. Toys R Us had about 10 per cent of that $2 billion pie, and was the largest of the speciality traders, followed closely by the ToyWorld chain. IBISWorld analyst James Thomson said that specialty retailers would pick up some Toys 'R' Us sales, but that that majority would go to department stores and online retailers. "While department stores also face growing competition from online retailers, they benefit from their diverse product range," Mr Thomson said. But while the market is concentrating among the largest players, smaller toy operators say they are thriving by carving out niches for themselves by stocking unique items not available at major stores, where the aisles are dominated by the latest licensed Disney or Marvel products. Rachael Arkovits opened the Treetop Toy Shop in Brunswick, Melbourne 10 years ago after she spent time working in the UK for a company that imported old-style wooden toys and saw demand for them in Australia. “We don’t need toys that have all these buttons that flash and make noise, and so that’s why I started this business," she said. "I feel like there is a boutique toy trend: people want to come to these types of stores, they love the experiences." While retail sector was tough, Miss Arkovits said her business was holding its own by offering service and products customers would not find in larger retailers, and predicted very little cross over between her store and Toys 'R' Us. “If I have a product and big store takes it on and they have it cheaper, I just won’t sell it anymore – I’ll find a new thing that’s right for us.” Steven Leighton, the CEO of ASX-listed toy supplier Funtastic, which distributes products including Pillow Pets and Razor scooters, said the decline of Toys 'R' Us meant there was no longer a retailer that offered the full range of products available in the market in the one destination. "That experience, and that level of destination for toys has left the marketplace – that's an issue for the industry," Mr Leighton said. "The other retailers now have the ability to revisit their representation of this category within their store footprints, and they have the ability to potentially increase their share." Mr Leighton said the immediate issue for suppliers was what to do with orders Toys 'R' Us had placed for Christmas 2018 and they had started preparing for, with other retailers now reassessing their Christmas plans in light of Toy R Us' decline. "That volume will still be required in the market place – who’s that volume going to be picked up by? that’s the discussion that is going on.” Another major toy supplier, who asked not to be named, said there was now millions of dollars worth of stock that would need to "find a new home". There was initially hope that a new owner would be found for Toys 'R' Us' Australian operations, after the global giant's head office and 735 stores in the US were wound-up in March after collapsing under billions of dollars of debt. Two private equity firms Allegro and Anchorage were circling, and it was possible it could be merged with the Asia business. But hopes were dashed when each of the potential buyers Toys R Us Australia backed out. Sources involved in the sale process said that the business was found to be unattractive when considering that its products had low profit-margins and that prices being pushed even lower by competition from Kmart, Big W and online retailers like Amazon.